According to March of Dimes, approximately 1 in 10 babies are born prematurely in the US each year. Definitions are evolving, but premature babies are generally those born before 37 weeks gestation. Most hospitals consider 24 week old fetuses viable, although some hospitals will treat them as young as 22 weeks. Delivering a baby at 24 weeks’ gestation is no guarantee of survival, but care in a Neonatal Intensive Care Units (NICU) can help increase the odds. With every week that the fetus remains in utero, the higher the chance for thriving and surviving. By full-term all organ systems are mature and fully functioning, including the brain, lungs, heart, eyes, ears, bowel and muscles. Fortunately, medical research and advances have increased the chances of survival in even the tiniest of babies. As a pediatric physical therapist, I have cared for these tiny “micro-preemies” from day one in the NICU and have had the pleasure of assisting many of them as they grow, thrive and become independent children. With premature babies, their development may lag behind full-term babies in the earliest stages. That does not mean they will not catch up, but here are a few things to keep in mind to support your preemie. The adjusted age is calculated from the date a baby should have been born (the baby’s due date). The chronological age is calculated from the actual birth date. Premature babies usually catch up with most developmental milestones by age two. Before this, and especially in the first year, they often develop in line with their adjusted age instead of their chronological (actual) age. 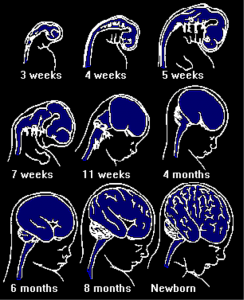 Keep in Mind: The timing of their development milestones will most likely be aligned with their adjusted age, instead of their chronological age; so a baby that was born 2 months early will likely hit milestone ranges 2 months later than their age calculated on a calendar. 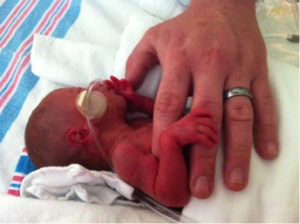 Premature babies often have less muscle bulk and tone than full-term babies. Their muscles are loose and floppy or sometimes described as “hypotonic.” As newborns, this makes it harder for them to stay in a flexed position and may delay development of their motor skills. Full-term babies are able to keep themselves in a nicely flexed position with arms and legs tucked up (in the fetal position). I often explain to families that this is the result of their preemie babies having had a shorter “workout program” than a full-term infant. They did not get to push and kick against resistance the same time frame leading to lower muscle tone and overall body weakness. Because of this, it is strongly recommended for premature babies to be followed up by field specialists such as pediatric physical therapists. They can help them catch up and strengthen the right muscle groups to accelerate progress. Keep in Mind: Preemies often need the support of specialists to help them overcome some of their limitations; talk to your doctor early to start getting them the help they need. The brains of premature babies also had less time to develop, often resulting in lower gray matter volume and neural connectivity at birth. These differences can have implications in timing and quality of cognitive and social development. When a baby is in a light sleep, they will move around quite a bit and make some noise. You may even see the baby’s eyes open and rolling back into their head. Don’t worry, this is completely normal. They will spend most of their time in light sleep. As they grow older and stronger, they will begin to have more full cycles of light and deep sleep. This deep sleep is a baby’s most restful stage of sleep. Most preemies will have very little deep sleep until they are closer to term in age. Keep in Mind: Sleep is critical for all babies, but especially so for premature infants. Make sure you have a cozy environment for them and factor quiet sleep into your plans. Many babies are happy to sleep in strollers or on the go – for younger preemies, try to give them some consistent sleep in their beds. With patience and attention, your premature baby will make their unique developmental journey step by step. Understanding their differences is the first step to your child’s wonderful journey ahead! Editor’s Note: When your premature baby is ready to start doing BabySparks activities, the app will automatically use their adjusted age to provide recommended activities. We do not recommend any premature baby doing development activities until a gestational age of at least 36 weeks. Morgan Bryant, PT, DPT has a doctorate is physical therapy, practice owner of Matrix Rehab, LLC visit www.matrixrehab.net, wife and mother of 2.